To read Part I of Decisão 2012, click here. NOW that we’ve clarified why I’m jumping into Brazilian Soccer, the question remains: How DOES a serious fan pick a sports team these days? The closest I ever came to choosing a team was when I chose South Beach and palm trees (UM) for college over chewing tobacco (FSU) and swampland (UF). Yet this decision will shape a big part of my trajectory for the rest of my time in Brazil. Dare I say, it’s one of the most important decisions I’ll make all year. I imagine it as being similar to choosing a wife (imagine because I’m not married). You run her through the gauntlet, make sure a certain percentage of your friends and family like her, and if your history of relationships is spotty, you have your buddy in Washington run a background check. You can’t just change your mind if it’s a bad match in 6 months, either. This isn’t eHarmony, or “The Bachelorette”. The process needs to be thorough. Tommy-Lee-Jones-in-The-Fugitive thorough. You see, there are no pre-nuptial agreements in sports. Bill Simmons breaks down the Man Laws associated with this here (scroll down to ‘Loyalties’), but to sum it all up, if you ever change allegiance or start cheering for more than one team, you’re forever known as a bandwagon jumper. That’s because sports bigamy, like real-life bigamy, is forbidden. Even in Utah. Once you pick sides, it’s till death do you part. Just like marriage. No annulments. No divorce attorneys. That guy who cheers for the Lakers/Yankees/Steelers, but was born in Miami? Never fully respected by his peers, and stripped of full Man Card privileges. No control of the TV remote on Sundays. No inclusion on the short list of people to call when you have an extra ticket to the game. 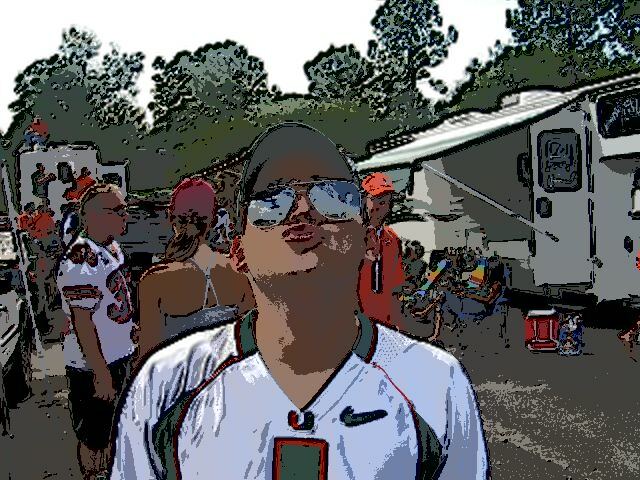 It’s like sports fan leprosy. You may as well load up on antibiotics and flee the country. The young Jonah Hill look-alike on the left? More highly respected as a fan than LeBron. Bottom line, if I’m going to do this, I’m going to do it the right way. So I surveyed my friends. Interrogated my students. Dug through local papers. Turned down bribes. Devoured the Wikipedia pages. Watched the games. Compiled a Google Docs spreadsheet. And then, re-read Sports Guy’s 2-part article on choosing an EPL team, which still holds up 5 years later. Come to think of it, I’m pretty sure there are biotech professionals who’ve done less research than me this past month. But I’m ready now. The Brasilerão, as it’s known here, starts in less than two weeks. And despite Copa Libertadores already being in the knockout stages and the Campeonatos Estaduais (State Championships) having concluded, my self-imposed deadline for choosing a team is May 15th. The team has to be relevant- Needless to say, this eliminates any team not playing in Serie A, which is the main league in Brazil. But it also gets rid of several others due to a lack of followers/buzz. The biggest casualty is São Paulo’s very own Portuguesa, who despite being called up this year after winning the 2011 Serie B (the 2nd division), doesn’t have much of a following. And that was after counting Karine El Kurdi twice. The most exciting word used by those surveyed was “colonial” (the city’s Portuguese population founded them in 1920) which, of course, is not that exciting. Atlético Guaianiense- Their stadium holds a whopping 8000 people. I’m sure there’s a good reason for this, but I’m not that interested. Pass. Náutico- Their mascot is the opossum, they’re considered elitists and they’ve never finished better than 6th. Other than that, they’re a fine selection. Pass. Ponte Preta- Refusing to be topped by Nautico, Ponte Preta (translation: black bridge) uses the female monkey as their mascot, due to the initial racism against the club for being one of the first Brazilian teams to accept blacks. Heavy stuff. Pass. Sport- Only title was in 1987, with an asterisk due to the 13 most popular teams refusing to play that year in protest of the format. Being a paper champion is almost worse than never having been one. Pass. Internacional- Their stadium makes Atlético Guaianense’s stadium look like the Maracaná. 5000 capacity. My high school held more than that. Pass. There has to be hope- Not of a championship necessarily, but of being competitive. Going into the last month of the season in 2011, there were still a handful of teams fighting for the top spot. The top 4 teams make Copa Libertadores, Mexico and South America’s version of the Champions League, so even if you’re in the top half the season will be entertaining. Hope. That’s all I ask. Cruzeiro- My roommates are Cruzeiro backers. I witnessed their pain first-hand last season as they fought to avoid relegation. When they talk about Cruzeiro, it reminds me of me talking about my teams back home. Pass. Atlético Mineiro- Having said all that about Cruzeiro, I can’t get behind their most hated rivals either, as that would probably lead to a Big-Brother-esque eviction from Casa 1. Pass. Botafogo- The popular Rio team is named after the neighborhood mostly known for the team, so there’s that whole Green Bay Packers angle. But their first mascot was Donald Duck, which was later abandoned due to royalties issues. No, really. Pass. Sorry Rio. Still love you. The team has to be in São Paulo State- The whole point of jumping in is to get the full experience. 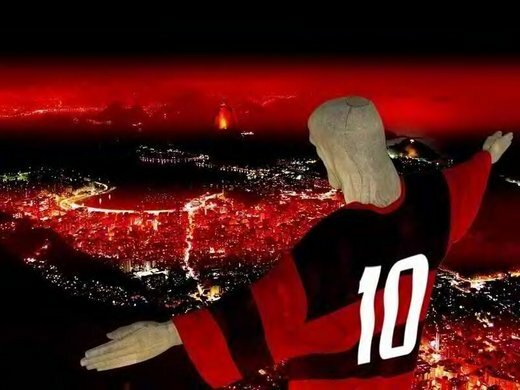 Even if I were to cheer for Flamengo, possibly the most popular team in the country, I wouldn’t have anyone to watch it with here in SP, and the games are always second-billing behind the local teams. Esporte Clube Bahia- In 2007, they had the highest average attendance of any team in Brazil despite playing in the 3rd division. They’ve since moved back up to the 1st division. Pretty impressive. Unfortunately, they’re just too far away to get excited about. Pass. Coritiba- Haven’t won since 1985. But did win 24 straight in 2011 and are considered the best in the state. Supporters are known as “coxas“, which translates to thigh, as in “coxinha“, the mouth-watering Brazilian concoction, most famously served at Bar Veloso. And their mascot is an old guy called Grandpa Thigh. Lots to get excited about! But not in SP. Pass. Vasco De Gama- Named after the Portuguese explorer (bonus point), the 2011 runner-up is part of the same comprehensive sports program that produced NBA center Nenê. Their derbies against Flamengo are the most-watched in the country, so there’s the strong rival factor. But they’re Rio-based, so they’re a no-go. Pass. Grêmio- With over 8 million supporters in Brazil, 2 National Titles, and plenty of talented fans in Porto Alegre, Grêmio is definitely relevant, and worth a road trip just for a game. But I’ll be sticking to SP for now, gaúchos. Pass. Figueirense- Florianapolis-based team whose mascot is “Furação“… a hurricane! While this would make my hurricane warning flags from UM’s glory days reusable, Floripa is way too far to merit inclusion in the next round. Pass. Fluminense- Rio-based 2010 champion and 2011 2nd runner-up, “Flu” is where Brazilian striker Fred currently plays. Seeing ‘Fred’ on the back of a Brazilian jersey always kills me, even to this day, so every game would be enjoyable, win or lose. Hate their unis, though. And they’re not in SP. Pass. Too many accomplishments for my liking. There can’t be any imminent embarassment- This is a difficult one of course, because avoiding a really bad team is bandwagonism to a smaller degree, but given the state of those I’m already faithful to, I just can’t justify walking into certain sports fan death, on the pitch or off. 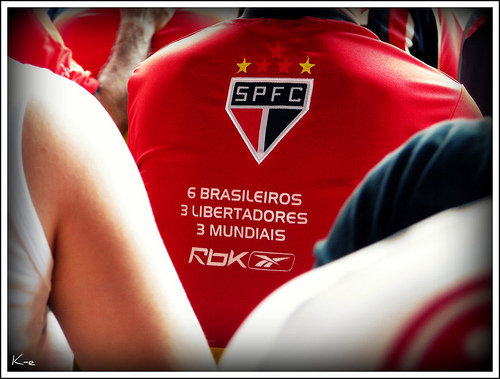 São Paulo Futebol Club- Despite being the only team to bear the name of the city I call home, SPFC’s reputation is insurmountable. Known locally as “Bambis”, some of the key words that jumped out at me during my surveys were “pretty boys”, “privileged”, “stuck-up” and… err… effeminate, for lack of a better word. Unfortunately, they don’t mean Cacau (see below). They’re the New Kids On The Block of Brazilian Soccer. Plus they won 3 consecutive titles just a few years back, so they’re way too successful to join. Sorry, São Paulistas. Pass. Which leaves us with just THREE teams. These are my options. Now that I’ve narrowed it down to 3, the criteria gets a lot more specific. I’m not letting anything slide. Uniforms, sponsors, stadiums, chants, and much more. I’m rewriting the book on choosing a sports team. Real men don’t dive in to these things. They can’t and they won’t. As Biggie said in “Ten Crack Comandments”, there’s rules to this ‘ish’. Brazilian Soccer is my case study. I’m writing myself a manual. Will it be Pelé’s Santos? My decision is one week away. Every opinion counts. Are you a Santos, Corinthians or Palmeiras supporter? Who do/don’t YOU think I should choose? Have you ever watched a Corinthians’ soccer game at the stadium? Believe 10k, its the most excited experience related to support a team. Try to purchase the tickets for the next game…if you want, you won’t repent. What conclusion did you come to in the end? I saw the tour company you set-up. Good idea, definitely a gap in the market for it! BTW if you have a chance take a look at the post I have just written about my own dilemma about which SP team to choose. Finally posted it! Still undecided, I pushed my decision back now that I’m doing the Futebol Crawl tour. I just can’t justify any decision without attending all 3 of the team’s games in succession. Today is Corinthians. Love the post! Will leave my comments straight on there though. I blame Wikipedia for any and all mistakes! Haha. They are not in SP so they never had a real chance, but my readers will know for their decision at least, thanks for reading! CHOOSING A BRAZILIAN SOCCER TEAM, PT.III- VAI CORINTHIANS? Next post: CHOOSING A BRAZILIAN SOCCER TEAM, PT.III- VAI CORINTHIANS?